There ARE Answers in Genesis! 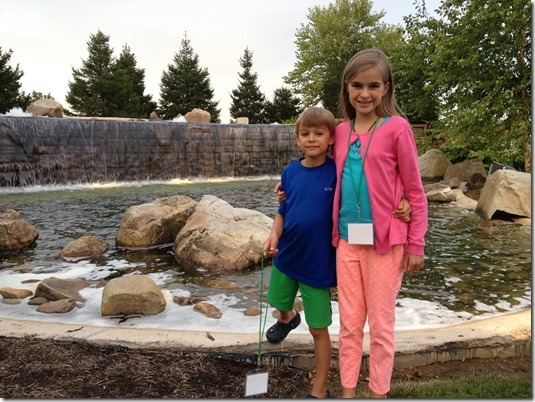 We stayed in Sevierville, TN, at the River Plantation Campground while we attended the Answers in Genesis Mega-Conference. We’ve become growing fans of AIG as we’ve delved into more of their materials and teaching and it’s really challenged and changed our faith. 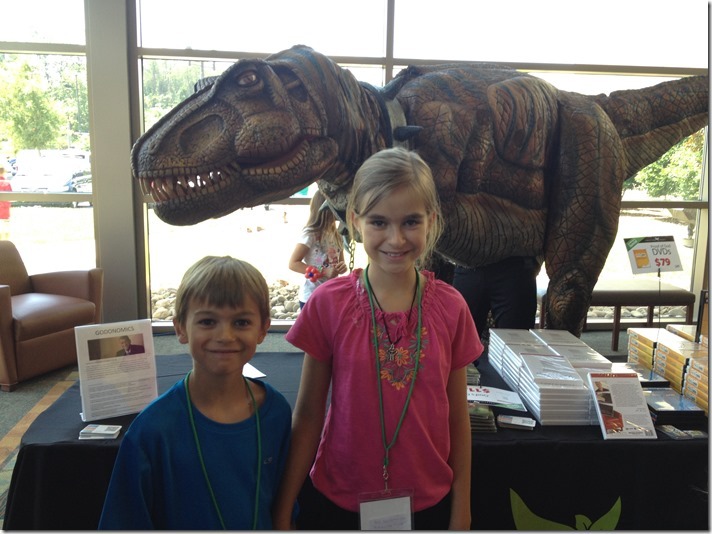 Last year we attended their Family Conference in Branson, MO and were excited to see what we would learn this year! The kids attended a VBS all week while the adults were in the main sessions. They had a really great time, and Sweet Pea made a good friend there. One of the main messages AIG tries to promote is that worldview is so important, and to a Christian, the Gospel is everything! The scientific evidence all around us, what we see in nature, how we view others, all depends on the “glasses” (our worldview) we see life through. For a Christian, that should be the Bible. Everyone HAS a worldview of some sort, we all wear glasses–whether it’s humanism, atheism, me-ism, some other ism, or something without a name–and what that worldview is will determine how everything around us is interpreted. 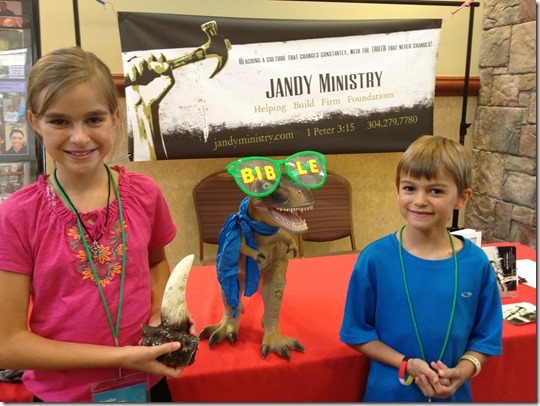 Why does AIG talk so much about dinosaurs (that’s not the only thing they talk about by far…)? Well, I don’t know what they would say, but I think it’s because dinosaurs are cool!! And, if you understand how all the scientific evidence surrounding dinosaurs, fossils, and natural selection actually point to a CREATOR, it can change your ability to trust the Bible as infallible and as a steady place to base your faith upon. Short version: if we can believe the Bible is accurate in its first 11 verses about how our world (and we!) were created, we can trust our God about everything else He says in His Word. What an amazing sense of freedom to know that science and the Bible DO support each other!! I don’t have to choose either of these extremes. I am free to wholeheartedly believe what is written in Genesis and I don’t have to deny the scientific evidence to do it! 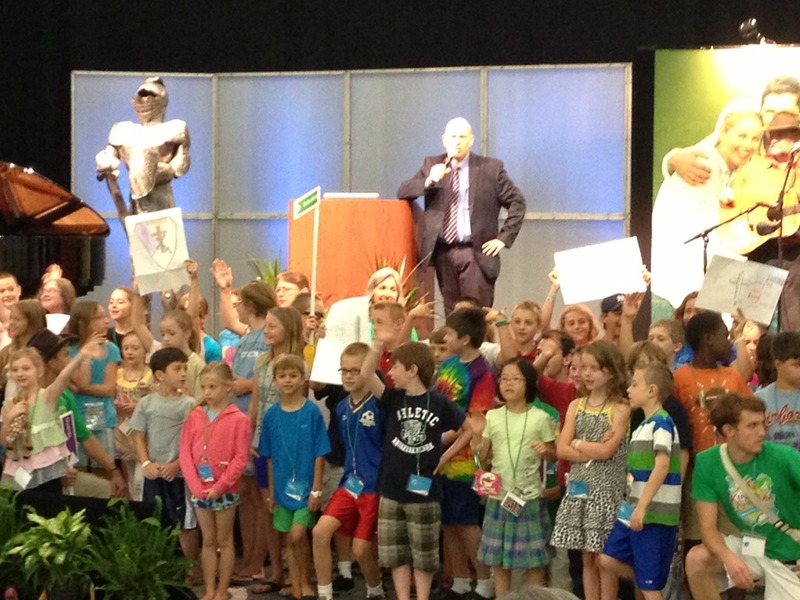 The last day of the conference, all the kids got up front and sang a couple of the songs they had learned. Spunky Monkey was very unsure of doing this, so I had to laugh that he ended up front & center! (Steve Ham, Ken Ham’s brother is at the mic and Buddy Davis is on guitar on the right.) Looks like he got over his nervousness. This is only about half of the kids who were there—Sweet Pea was too far in back and to the right of this picture for me to get a good picture of her. 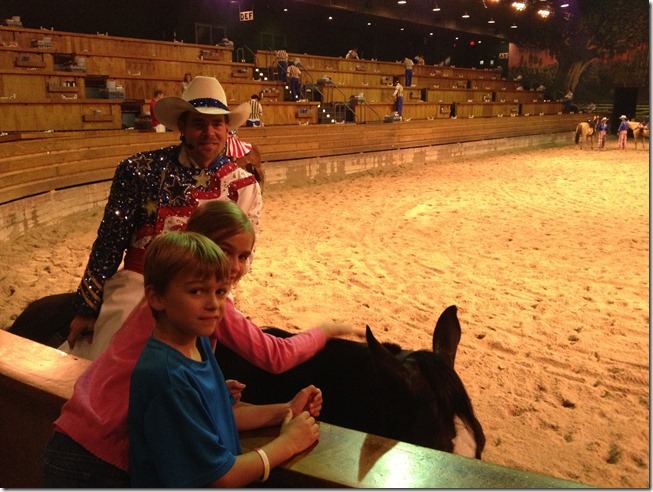 Thursday after the main part of the conference ended, AIG had a group attend Dixie Stampede. Sevierville is Dolly Parton’s hometown and there is Dolly stuff everywhere, including DollyWorld. We skipped that one. 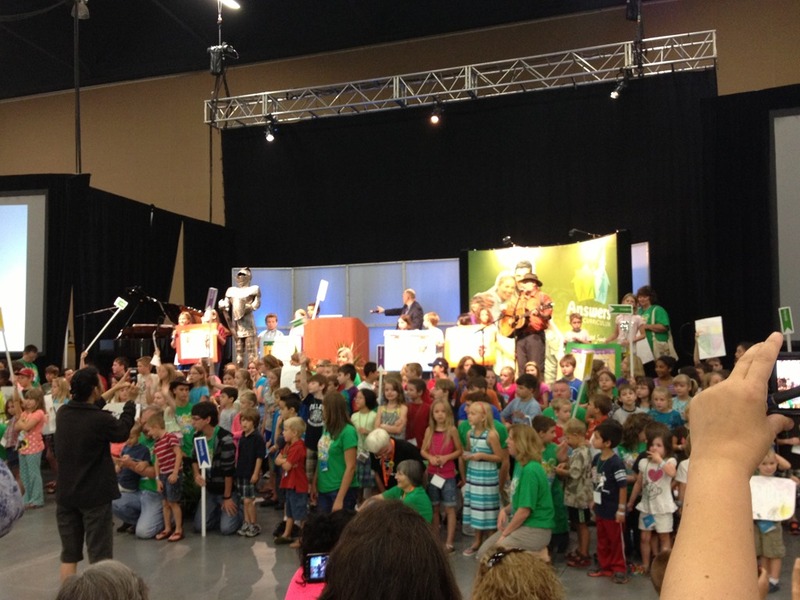 The kids visited some of the performers after the show. 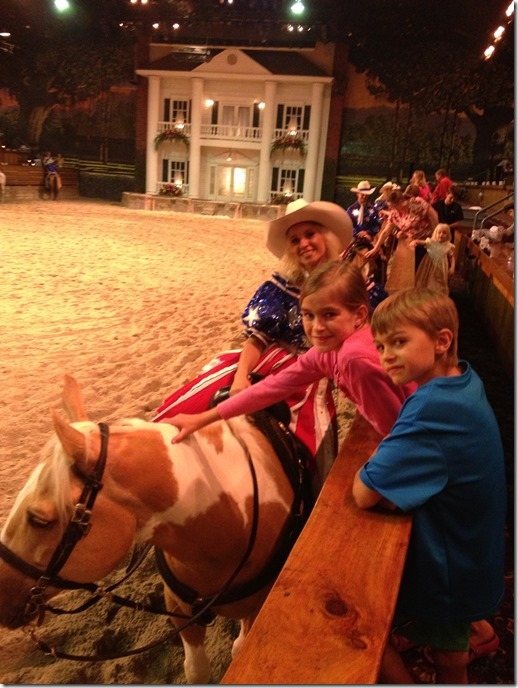 It was a fun show—beautiful horses, costumes, racing pigs and ostriches, fireworks, patriotism, and gobs of food! And no silverware to eat it with–Sweet Pea was very put out by that (I kind of was, too). And, take it from me, if you have the slightest horse allergy, dining in an enclosed space with LOTS of them running around for an hour and a half will certainly trigger said allergies!! I sniffled and sneezed for the next week.